This page will explain the Improvement Activities for MIPS, and how to record participation for these activities in TRAKnet. Improvement Activities is one of four categories that factor into your overall MIPS Composite score. For more information about MIPS and its parent program, MACRA, click here. For the Improvement Activities fact sheet published by CMS, click here. Performing one of these will equal the 40 points needed for a user to earn the full 15% under Improvement Activities. A user who is defined as a small practice (less than 15 providers) will have any activity doubled; For example, the performance of one High Weight activity (20 points) for a small practice will double to 40 points and earn the provider the full points under Improvement Activities. Additionally, Improvement Activities are divided into separate subcategories such as Achieving Health Equity, Behavior and Mental Health, etc. The Improvement Activities are not performed within TRAKnet, but provider participation and performance in these activities may be recorded and viewed within TRAKnet through the Improvement Activities report. For clarity's sake, this page will distinguish between the participation and the performance of an activity. Participation indicates that the provider will be tracking an activity, regardless of whether or not they have performed that activity. Performance then indicates if the provider has satisfied the requirements of that activity. The Improvement Activities Report can be viewed under Reports > Quality Payment Program > Improvement Activities. The report is filtered by provider and by reporting year. 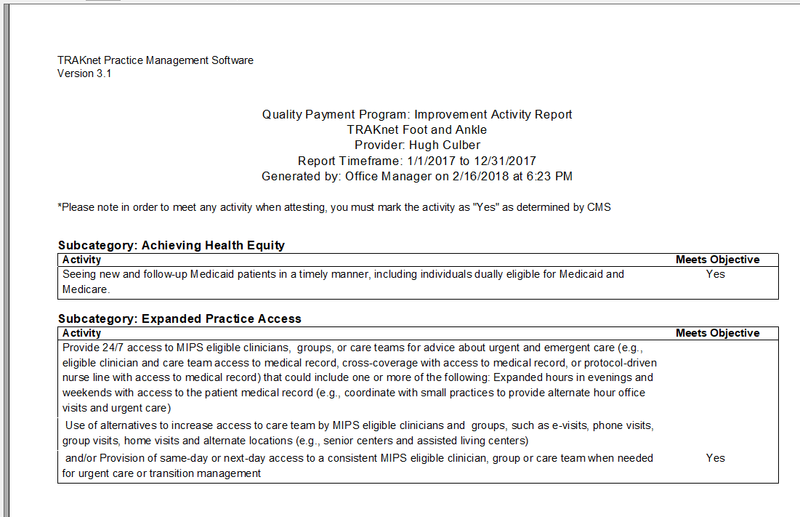 From the Improvement Activities report screen, select the provider whose Improvement Activities performance needs to be modified, and click the Configure button. 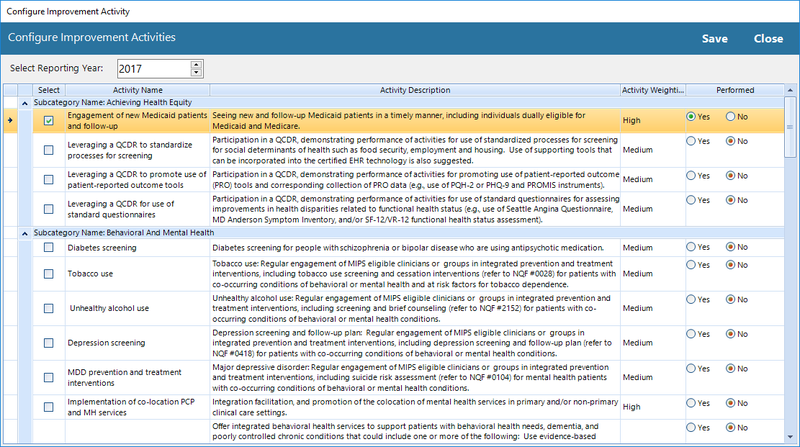 On the Configure Improvement Activities screen, select which Reporting year you wish to modify. To record participation for an activity, check the selection box in the left-hand column. Any activities that are checkmarked will appear on the report ran for that provider for the given reporting year. To record performance for an activity, select Yes under the Performed column. Any activities that are indicated as Performed will indicate that the objective has been met when the report is ran for that provider for the given reporting year.